Since some heavy rainfalls are expected in the next several days, I decided that a trip to the Vedder was needed today before the river colours up once again. It is after all, prime time for coho salmon, so I better take full advantage of it before time runs out. This was my second outing to the Vedder this month. Normally I am able to do several outings by mid October, but other priorities have prevented that. Perhaps I was eager, I actually arrived at our meeting place five minutes earlier than Chris. We made our way through the trails in the dark and reached the wading spot. The water looked awfully swift but Chris assured me that it was wadeable. Being significantly lighter in weight, I am always concerned about wading. There have been times when I found myself lifted off the river bed and floating downstream after following Chris’ wading steps. There were no such problems this morning. We buddy-waded and the depth was only up to our knees. We were ready to fish with many spare minutes before light. Fishing started out slowly. The float only dipped once every couple dozens of casts, for Chris anyway. I struggled to find a bite for the first hour. Chris broke the ice by landing a good sized jack coho salmon, while making fun of my comical performance yesterday with my jack. This year’s high abundance of jack coho is a positive indication of next year’s coho salmon return. When my float finally dove, I was ready for the hookset. 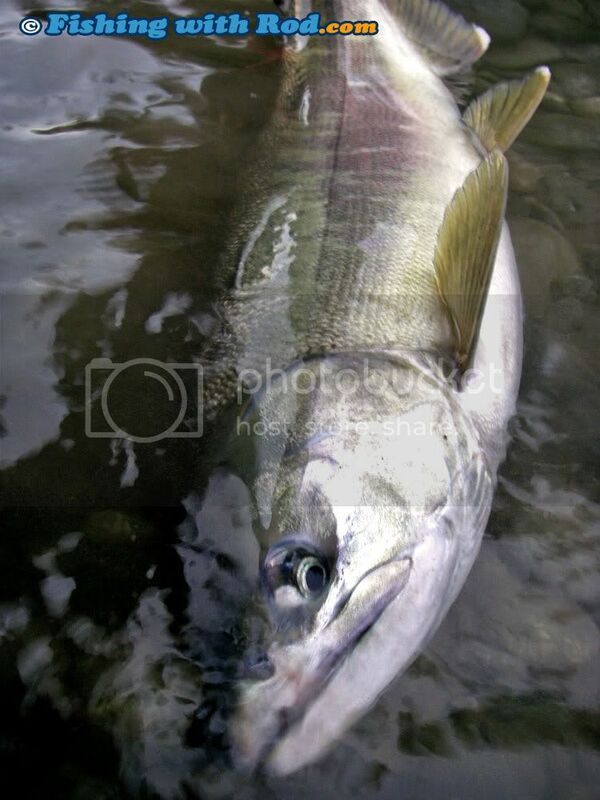 A good looking chum salmon showed herself on the surface right away. Female chum salmon are much easier to handle. This one was brought in no time. Upon close inspection, it was quite fresh but I decided that it would be released. 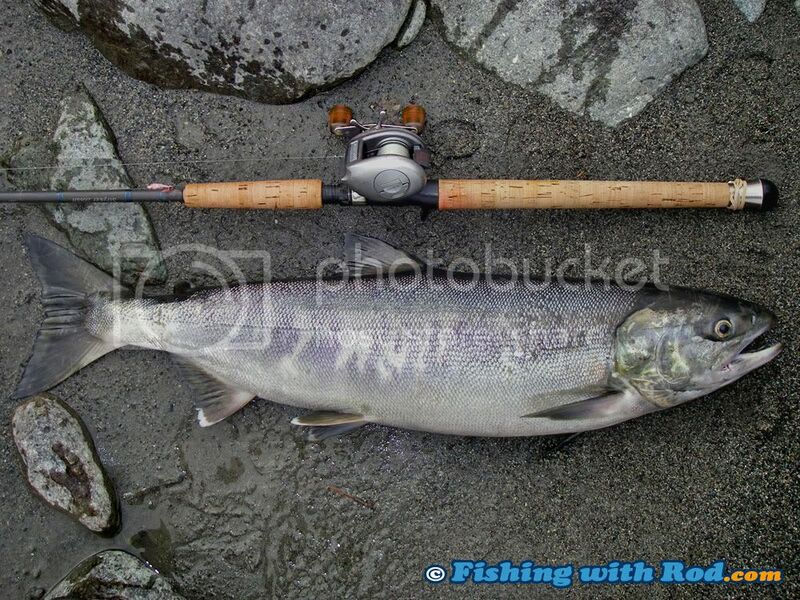 Beside a couple more chum salmon hooked by Chris, that was it for the morning in the lower river! Chris ended his trip at 9:30am as he had other daily duties. I decided to fish for the entire day to benefit the most out of my high fuel expense from Steveston. I ventured to mid river in late morning. 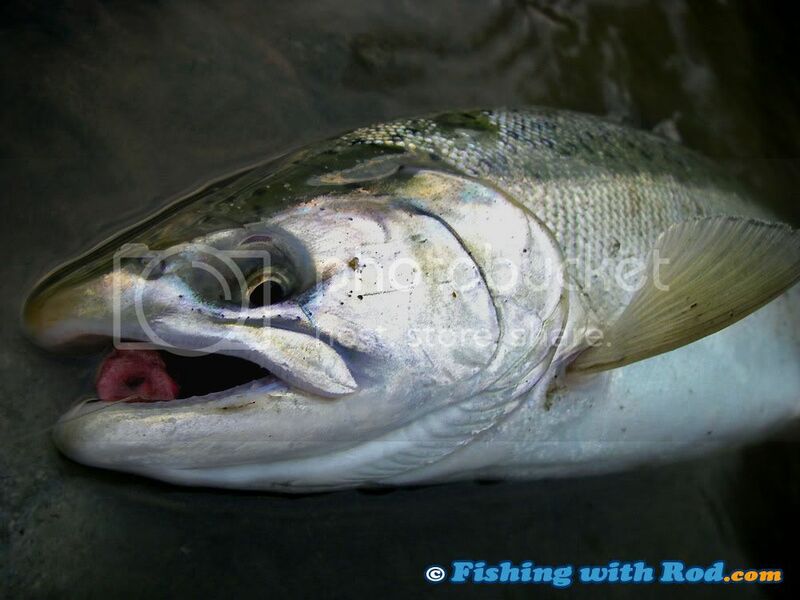 Perhaps the brief rise of the river level earlier this week has pushed all the coho salmon up. Water clarity degraded slightly during the day but improved as the afternoon went by. The first couple of spots that I thought would produce were not delivering at all. I finally reached one of my favorite spots by mid afternoon. It is a long stretch with medium sized boulders, which create a moderately turbulent flow. In the past I have seen fish moving into this run during the day, holding and biting, so I was hopeful. I arrived and found one other angler, who reported slow fishing in the morning but improvement just before my arrival. 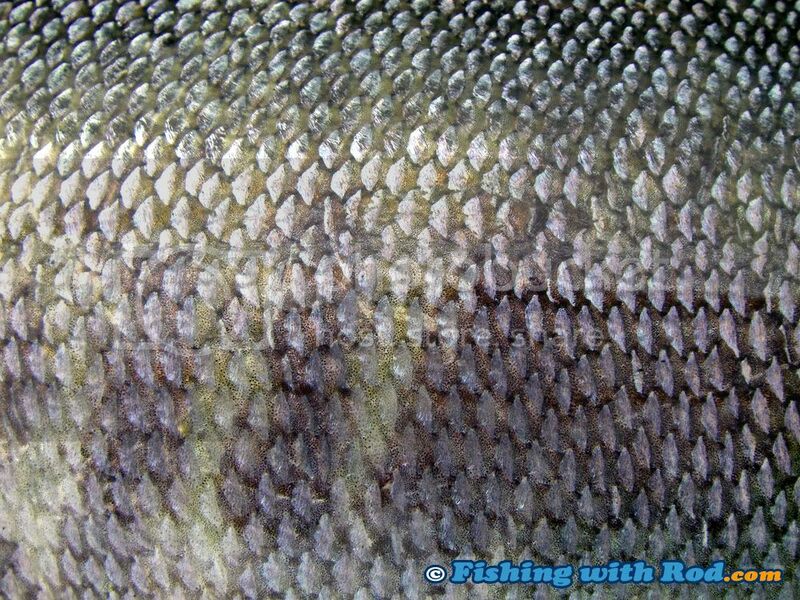 I could see schools of chum salmon making their way into the run. Within a few casts the float was buried repeatedly. Several hookups produced a big male chum salmon and a rather big silvery fish, possibly coho salmon, which quickly got off after one leap. The rest of the day was no different to what we experienced in the morning. There were periods of sporadic bites, but also longer unproductive periods. The white spring roe from two weeks ago worked magically when the bite was on. Unlike the lower river, most of the chum salmon that I encountered in mid river were somewhat coloured and undesirable for keeping in my opinion. Almost every drift would resulted in a float burial. By late afternoon, I decided to keep a doe that was even nicer than the one I caught in the morning. The entire day was dry, which was a pleasant surprise because the weatherman forecasted the opposite. The highlight of the day was actually not the catch on the end of the line, but the capture on the lenses. 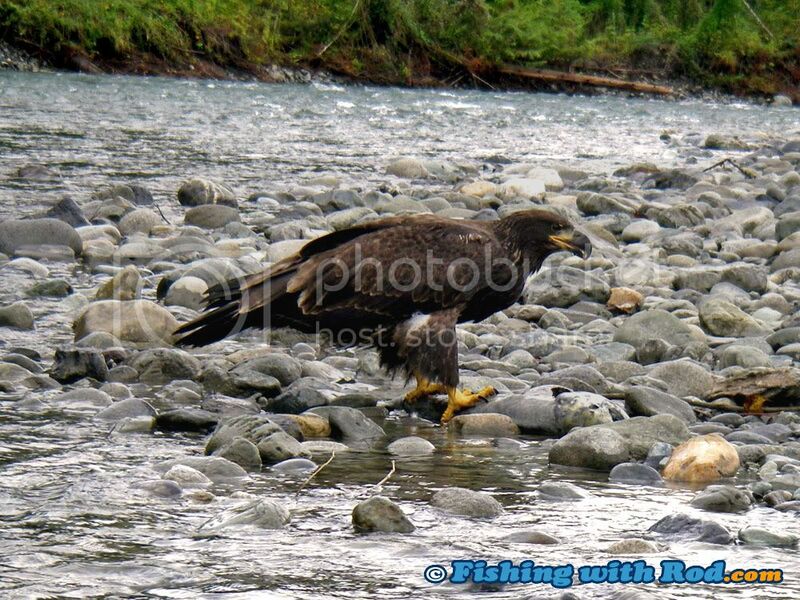 I was lucky enough to creep in closely to this young eagle, which was busy feeding on a dead chum salmon. I sat just 10 feet from it for around ten minutes and managed to take plenty of photos and video clips while it dined. 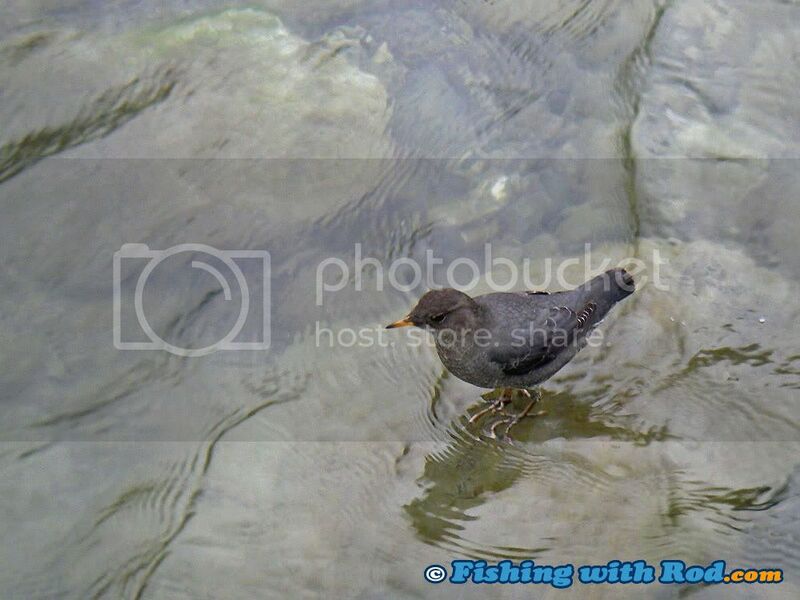 The other bird encounter today was the usual American dipper, which was always around me feeding on leftover roe pieces. This entry was posted on Friday, October 17th, 2008 at 1:31 pm	and is filed under Fishing trip. You can follow any responses to this entry through the RSS 2.0 feed. Both comments and pings are currently closed.